A bill proposed by Representative Fred Kessler (District of Milwaukee) proposing that Hmong history be included in school curriculum has been re-introduced after it failed to pass the first time. Current law states that school boards should instruct students on state, national and world history. The bill proposes that it also includes the role of the Hmong fighting alongside the United States (US) in the Vietnam War, the persecution of the Hmong by the Laotian government and the reasons for emigration of many Hmong to the US. With roughly 50,000 Hmong Americans in Wisconsin, supporters of the bill stress that it is important to make their contribution to US society known whilst also celebrating their cultural heritage. The bill is currently in the hands of the Education Committee, whom is hesitant to approve it as it feels it will overload students. Hmong Americans make up nearly 1 percent of Wisconsin's population and lawmakers are once again considering the question: Should a history of the Hmong be required in the state's public schools? Supporters of a bill to require Hmong history lessons — mostly Democrats, and at least one Wausau-area Republican — say young people should learn how Hmong fighters aided the U.S. military in the Vietnam War and came to the U.S. as refugees. There's roughly 50,000 Hmong in Wisconsin. "The Hmong people have made such significant sacrifices and are a rich part of our community and state," said state Rep. Katrina Shankland, D-Stevens Point, one of the sponsors of the policy. The bill has failed before. Rep. Fred Kessler, D-Milwaukee, introduced it every session for about a decade. The bill is now in the hands of Education Committee members and its chairman, Republican Rep. Jeremy Thiesfeldt of Fond du Lac. He doesn't like the idea of placing new requirements on the state's schools without taking other mandates away. "Schools have a lot of things to cover," Thiesfeldt said. "There's only so many hours in the day and so many days in the school year." Kham Yang, board president of the Hmong American Center in Wausau, understands why legislators would shy away from the bill. Yang doesn't want Hmong history forced on unwilling listeners. However, he does want to make sure that information is out there for people open to it. He likes the bill and said it's a "huge step forward." "Hopefully more people will learn about the contributions my parents and my grandparents gave to the U.S.," Yang said. During the Vietnam War Hmong people helped the CIA in a surreptitious mission in Laos. 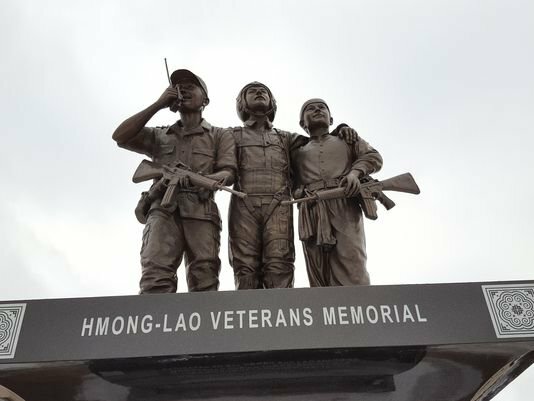 They rescued downed American pilots, something depicted in a Hmong-Lao Veterans Memorial unveiled last September outside the Marathon County Courthouse in Wausau. The Hmong faced persecution for their support of the U.S., and about 40 years ago they began coming to America as refugees. Many now own businesses throughout the state. But there are still racial tensions. When Rep. Kessler first proposed the bill, there was hostility in the state after a Hmong hunter, Chai Vang, killed six people near Rice Lake in November 2004. "That's not fair," Kessler said of the general hostility at the time. "The Hmong were our allies in the Vietnam War. ... They're not just illegal immigrants." The Hmong role in the Vietnam War is important history for Wisconsinites and people across the nation, said newly-elected Rep. Pat Snyder, a Republican from Schofield. He thinks young people should realize the sacrifices made by the Hmong. "I would be in favor of a bill like that," said Snyder, who represents part of Marathon County, which is home to 5,600 Hmong residents. Hmong make up more than 4 percent of the county's population, the largest proportion in the state. But Snyder won't get a chance to vote on the bill unless it makes it out of committee. Kessler said in the past opponents did not like the idea of curriculum adjustments by special groups — dairy groups wanted schools to teach the importance of farms, labor groups wanted to teach the importance of unions. Shankland said the policy is akin to Wisconsin Education Act 31, which requires lessons on the history and culture of Native American tribes in the state. "It's really important that we understand our cultural heritage — of all groups," she said. Thiesfeldt said he'd be more open to the bill if its sponsors can recommend two education requirements to repeal, to balance out a new requirement on Hmong history. Current law requires school boards to instruct students on state, national and world history. The bill would add the following details to that legal requirement: "including the role of the Hmong in fighting for the United States in the Vietnam War, the persecution of the Hmong by the Laotian government after the Vietnam War, and the reasons for the emigration of many Hmong to the United States."